It was an exciting weekend in my hometown of Easton, PA. Our public market finally opened! The Easton Public Market has a collection of vendors providing the community with the freshest meats, seafood, cheese, farm stand produce, etc. The best part is there are vendors providing delicious already made food, so I can eat while I shop. It is basically our very own indoor farmers market. So of course I took this opportunity to buy the freshest ingredients to make a fantastic dinner! (If you are reading this and you are not from the Lehigh Valley, PA area you can easily find these ingredients from your local market/grocery store.) My first stop was 3rd & Ferry's Fish Market where I picked up some beautiful looking scallops. Next I headed over to Dundore & Heister to pick up some steaks because I was craving some surf and turf. I chose a skirt steak and I could not wait to put it all together! When I was there I also grabbed a sour dough baguette from Scratch and some fresh greens and herbs from the farmstand. 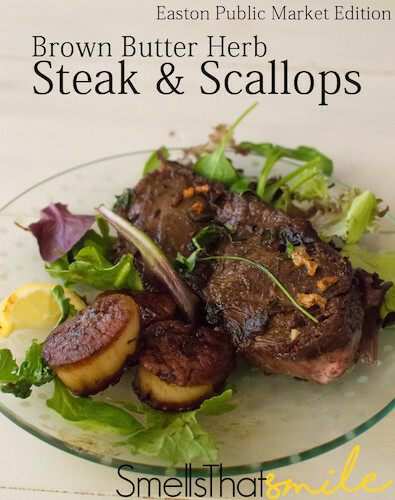 I put my steak and scallops over mixed greens, but if you are looking for a side there are so many different options that you can make from scratch or buy already made.